This topic contains 5 replies, has 3 voices, and was last updated by towhid 3 years, 7 months ago. i'm with troubles using the dokan with eshoopper. When I go to the appearance > personalisar (customizing) I can see all the products on home as I wish, but if I just go to my homepage like a normal user there's nothing on it. another question: i want to put the best selling stores on home, how do i do it? another: how can I take off the sidebar at home? I have provided you a new theme to your email. Please remove the previous one and active the current theme. After active the theme please set your permalinks as post name and product. To set the permalinks please navigate to Settings->Permalinks and Set your permalinks as Post name and Product. Hi There i am having a different issue with regards to the products on the home page. and how can I remove the sidebar from the home? another one: how can I put some stores at the home? like the best seller stores? another one: i need to do a menu with male or female clothes, I tought I could use cattegorys of products, but I don't think it's working. To remove sidebar from home please create a child theme and paste the following lines of code at the bottom of the theme's style.css file. Do you want at best seller widget at the sidebar? To enable the widget please navigate to Appearance->Widgets->Home Sidebar->Drag Dokan:Best Sellers widget. 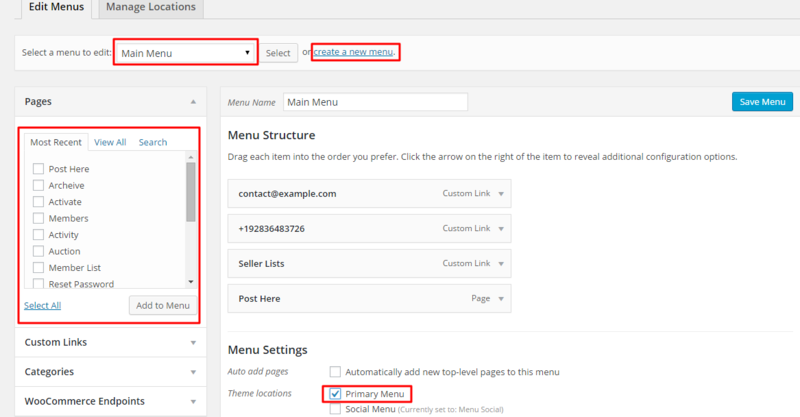 To create a menu please navigate to Appearance->Menus->click “create a new menu” link and enable Menu Settings = Primary Menu and click “Save Menu” button. I have marked few area in this screenshot. This indicates where you have to focus. The topic ‘products on home’ is closed to new replies.